Brazil’s conservative presidential candidate Jair Bolsonaro reached 39 percent support in a poll released Thursday, a new high placing him 14 points ahead of the second place candidate just three days from the national election. Brazilians are scheduled to vote on October 7. To win the presidency, a candidate must receive 50 percent of the vote. If no candidate reaches that threshold, the government schedules a run-off vote between the top two vote-getters. 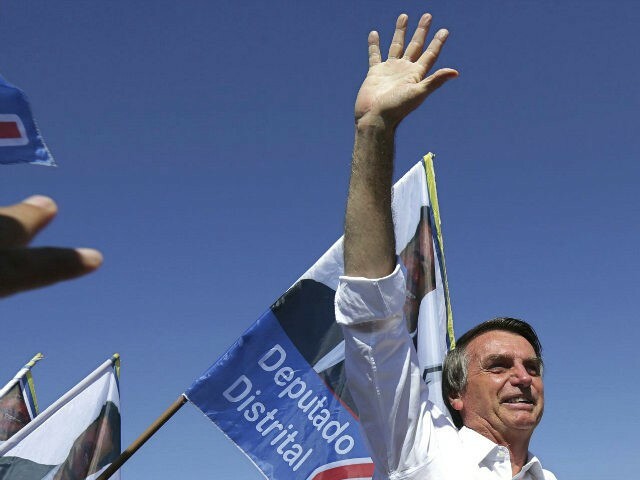 Bolsonaro, of the right-wing Social Liberal Party (PSL), does not appear close enough to the 50 percent threshold to prevent a second election, though reports this week indicate that the socialist Workers’ Party (PT) has begun to launch attacks on Bolsonaro that it was hoping to hold onto until the run-off as Bolsonaro inches closer to the threshold and support for their candidate, Fernando Haddad, dwindles, leaving him in a dead heat for second place with Ciro Gomes of the Democratic Labor Party (PDT). The Brazilian firm Datafolha released a poll Thursday finding Bolsonaro leading with 39 percent support, Haddad in second place with 25 percent, and Gomes at 13 percent. The Brazilian Social Democracy Party (PSDB) candidate Geraldo Alckmin rounds out fourth place with 9 percent. The upward mobility for Bolsonaro in Datafolha’s polling has been significant. Folha de Sao Paulo notes that he rose from 32 to 35 percent support over the past week, and was down to 28 percent support in a poll taken between September 26-28. This week, he was the only candidate whose support changed in either direction more than the two-percent margin of error. Datafolha found Bolsonaro and Haddad in a statistical tie should they face each other in a run-off election. The poll notes that, in the run-off round, “disapproval ratings are key,” both at high rates for Bolsonaro and Haddad. Bolsonaro maintained a steady 45 percent disapproval rating, slightly higher than Haddad’s 40 percent. Over 80 percent of those who said they would vote for either candidate said they were sure of their vote and would not change it. The poll, while the most recent one available, was taken before last night’s presidential debate. Bolsonaro did not attend the debate at the advice of his doctors; a socialist fanatic attempted to stab him to death in early September, and the candidate has yet to make a full recovery. Yet O Globo, whose parent Globo Network hosted the debate, called Bolsonaro the “star” of the show. As he was not there to defend himself, the other candidates dedicated their time largely to attacking the frontrunner, not each other. Haddad, O Globo noted, “chose to double down on the agenda of the left,” spending a significant amount of time defending imprisoned former president Luiz Inácio Lula da Silva. Lula was arrested and convicted this year of taking over $1 million in bribes and sentenced to 12 years in prison; prior to this sentencing, he was the frontrunner in the election. Despite being disqualified early this year from running, Lula prevented the PT from choosing a replacement until September, when Haddad jumped in at the last minute. This week’s Datafolha poll showed that most Brazilians support Lula’s imprisonment, O Globo noted, making Haddad’s defense a confusing move. This reality appeared at its most stark after Datafolha and Ibope, another major firm, dropped polls early this week. Left-wing groups organized dozens of protests against Bolsonaro nationwide under the banner “ele nao” (“not him”), an attempt to turn opposition to Bolsonaro into a feminist cause. Bolsonaro gained six points among women in the time between the last poll before the protests and the first one after, though he still holds a significant deficit with women voters. The penultimate Datafolha poll out revealed more bad news for the PT – Bolsonaro is gaining among traditional socialist voters. Ciro Gomes has now focused his campaign’s attention towards attacking Haddad, not Bolsonaro, in the hope of taking over the second-place position. “I’ve never lost in my home [Ceará state] – never, not once … and Haddad ran in an election less than two years ago and lost to a trickster like Doria in all areas of Sao Paulo,” Gomes told a crowd at an event Friday. Joao Doria is the former mayor of Sao Paulo, having defeated incumbent Haddad for the position. Prior to that political position, he was most popularly known as the host of the Brazilian version of The Apprentice. “He is not a bad person, I have nothing against his personality, but he does not have the energy … he does not have the authority to face this fascist wave,” Gomes claimed, referring in his latter remark to Bolsonaro.